NO BOND, NEW ROOF (2018), OUTSIDE PAINTED (2019), LOCATE ON GLENVIEW GOLF COURSE, Vaulted ceilings, PLANTATION SHUTTERS, STAINLESS STEEL APPLIANCES, 2/2 Courtyard Villa, located between Spanish Springs & Lake Sumter Squares in the sought after Village of Bellaire, short golf cart ride to Savannah Center and Glenview Country Club. Master bedroom has LARGE WALK IN CLOSET, Pantry in kitchen, CEILING FANS, RETRACTABLE SCREEN DOOR IN GARAGE, open floor plan, sliders to side courtyard as well as to the screened lanai, LARGE LANAI IN BACK OF VILLA HAS REMOTE CONTROLLED AWNINGS, garage is 1.5 so plenty of room for your car and a golf cart, garage features pull down attic stairs, shelving and cabinets for storage, LAMINATE FLOORING in living areas, carpet in bedrooms, tile in both baths, AIR FILTRATION SYSTEM connected to the air conditioner to filter air in the home, Villa is close to shopping, medical offices, restaurants, and major roadways. 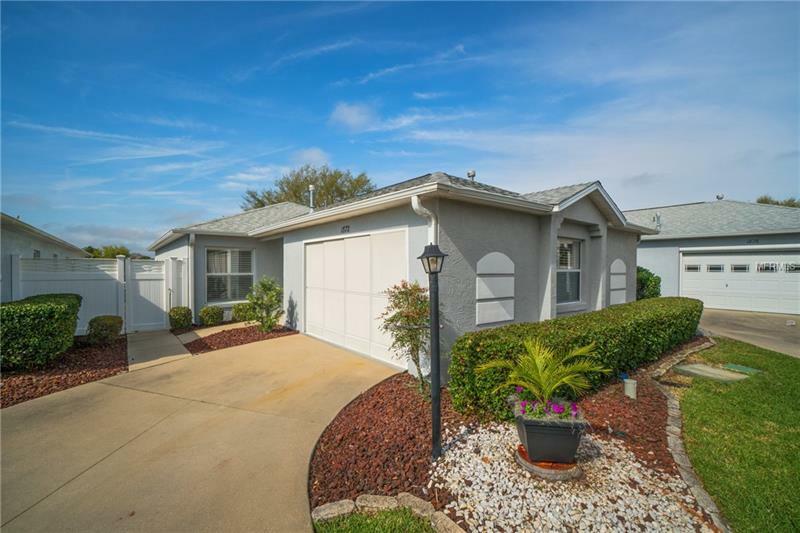 This home has a great backyard for your pet to run and play in the grass area overlooking the golf course. Enjoy morning coffee or the amazing sunsets from the Lanai. THIS VILLA COMES WITH A 1 YEAR HOME WARRANTY. Call for an appointment to see this well cared for Villa.